Welcome to Waters Edge 408 in the historic Taft district of Lincoln City! 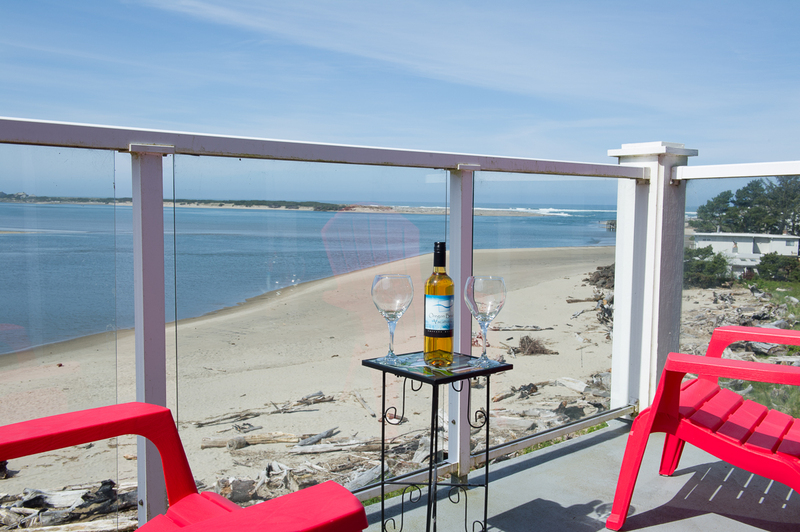 This beautiful two bedroom, one bath condo is right on the edge of the Siletz Bay, boasting a beautiful view of Pacific Ocean to the west and Three Brothers to the south! 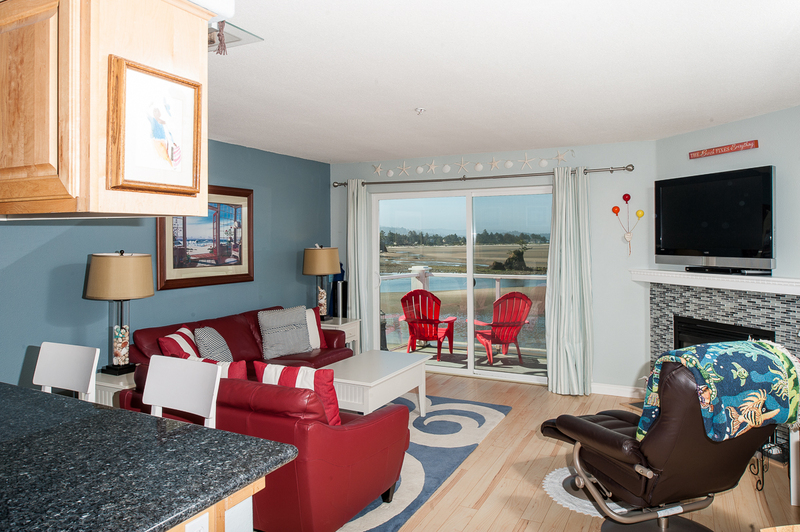 You'll be up close and personal with the beach from this fourth story condo! 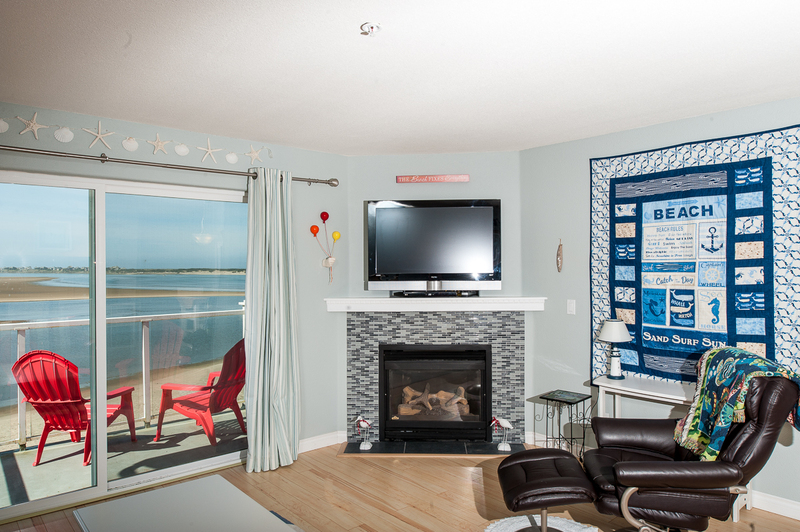 Walk inside and you'll find a beautifully decorated vacation rental! Rich color and stylish designs make this condo feel just like home! Relax on the couch and watch tv or step outside onto your own personal balcony and enjoy the cool breeze coming off of the bay. It's the perfect place to people watch and catch some sunshine at the same time! 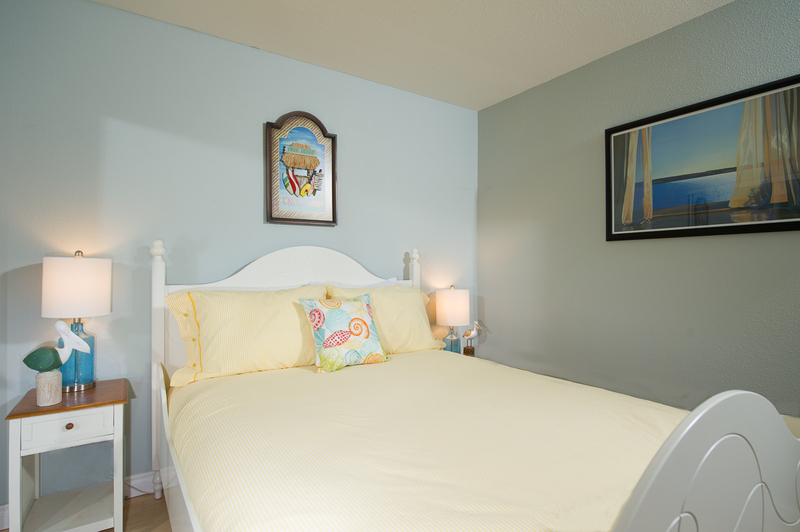 With a king bed and a queen bed in the bedrooms, this lovely rental is perfect for four guests! The kitchen is newly renovated, with brand new appliances, and everything you need to cook up something tasty, including a coffee pot, refrigerator, stovetop and oven, microwave! Head down to the beach and try your hand at clamming or crabbing. Lincoln City offers various clamming and crabbing clinics in the summer months that you'll love to partake in! There are also several restaurants and things to do within minutes of Waters Edge. Leave your car behind and explore the Taft District on your feet. You'll want to come back again and again to Waters Edge 408! Book your stay today with Oregon Beach Vacations! This unit will allow two dogs under 40 lbs. Larger animals will be required to be removed. Pets must be registered with Oregon Beach Vacations prior to your stay; Breed, Description, Weight, State License number for the dogs and city or county where license was purchased. "Absolutely loved the location, the awesome view and the lovely furnishings.The kitchen was well equipped. Next time I would stay much longer!" "Hello Aelene, thank you for sending in your review of your visit to WE # 408. We are pleased to hear you enjoyed the beautiful unit and the view offered from the unit. Hope you made wonderful memories that you can share with friends and family alike. We would enjoy hearing back from you to assist in planning of your next coastal getaway. Happy Holidays ~ Oregon Beach Vacations "
"What a wonderful place to spend a weekend with my son and girlfriend"
"Hello Aubrey, Thank you for your review. We are glad to see that you enjoyed your stay at Waters Edge 408. We hope to have you all back again soon!" "When we arrived, we loved the condo we stayed in and the facilities. The tub and the toilet were dirty and I had to clean them, but the kitchen area was clean and nice. The floor under the couches could have been swept and the rugs vacuumed, but over all we loved our stay in this condo and we would stay here again and again. The bedrooms were nice and the bed was comfortable. Just was a little disappointed that you pay a cleaning fee and the things listed above were not done. " "Hello Cheryl, Thank you for your review. We are glad to hear that you enjoyed your stay at Waters Edge 408. We are, however, sorry to hear that housekeeping didn't do a great job cleaning the unit for your stay. We would have gladly had housekeeping sent back out to the unit to remedy these cleaning issues for you. Please don't hesitate to give us a call into our offices should you ever have any issues with your unit. We hope to have you back again soon!" Everything about condo was great. Super clean and great Shower. "Nice and relaxing 😎 "
"Hello Robert, Thank you for your review. We are glad to see that you had a great stay at Waters Edge 408. We hope to have you back again soon!" 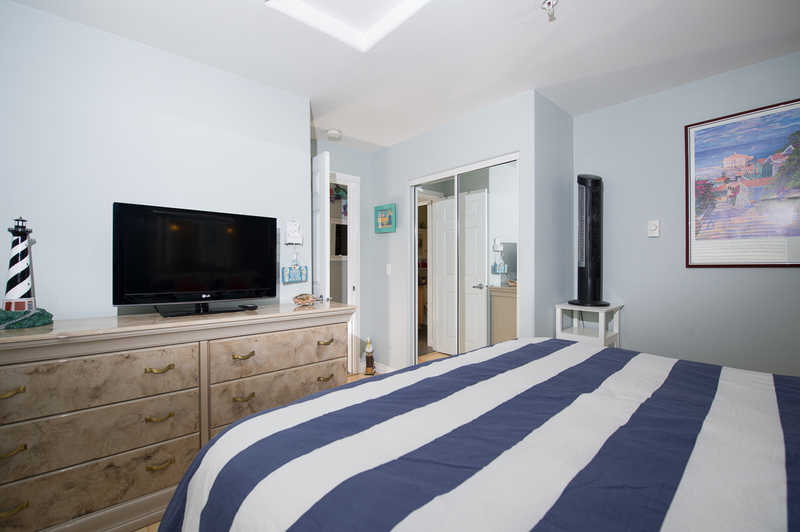 "Great location, comfortable and clean condo. Couldn't get the fireplace or the bedroom TV to work so that was disappointing but otherwise we'd stay here every time. " "Hello Michael, Thank you for your review. We are glad to see that you enjoyed your stay at Waters Edge 408. We are sorry to hear that fireplace and TV were not working for you. We would have gladly sent maintenance out to the unit to help remedy these issues for you. We hope to have you stay with us again soon on the Oregon coast." 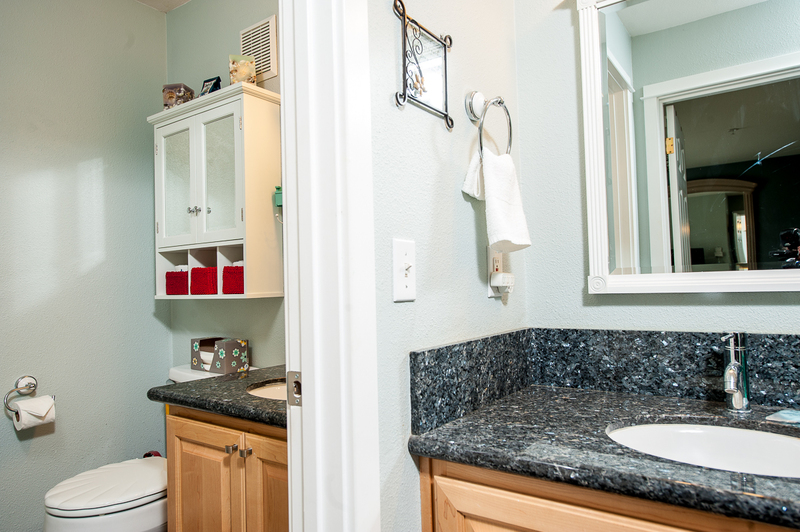 "Our unit was fully stocked with everything one would need to cook and wash laundry. Was beautifully furnished, clean and cozy. Would stay again in the same unit. Have stayed at Waters Edge many times and enjoyed my stay each time." "Hello Sarah, Thank you for your review. We are very happy to see that you loved your stay at Waters Edge 408! We are happy to hear that you are a return guest, and we can't wait to see you yet again on the Oregon coast. Thank you again for your review!" "The entire trip was filled with great scenery and a lot of beautiful trees. The coast line of Oregon is a variation of many other coast lines in the world.The variety of food measures up to the best in the states." "Hello John, Thank you for your review. We are glad to hear that you enjoyed your stay at Waters Edge 408. It sounds like you had a wonderful trip to the Oregon coast! We hope to have you stay with us again soon!" "Glorious time! Great fireworks view and splendid weather. Planning to visit again. " "Hello Sandy, Thank you for your review. We are glad to hear that you enjoyed your stay at Waters Edge 408 for the Fourth of July! We look forward to seeing you back again soon on the Oregon coast!" Great location, very comfortable for four adults! "We enjoyed our stay very much in this condo. It is nicely decorated and well-equipped. The weather was very cold and stormy, but we enjoyed storm watching by the fire. I will come back here again. I recommend this unit and look forward to returning in the future! " "Hello Tammi, Thank you for your review! We are so happy that you had a wonderful stay at Waters Edge 408 and are excited to see you back again soon! Thank you again for your review!" "Great place and location. Clean property." "Hello Jolynn, Thank you for your review. We are glad to see that you enjoyed your stay at Waters Edge 408. We hope to have you stay with us again soon on the Oregon coast." 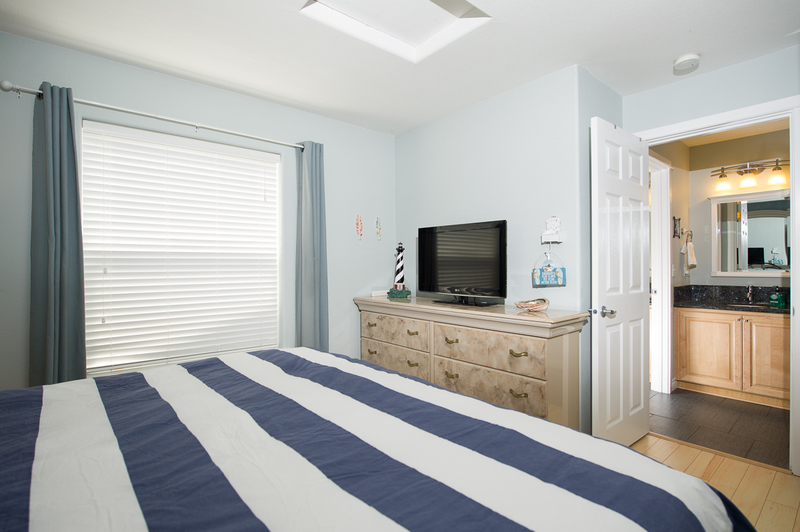 "We had a wonderful experience at this vacation rental. Everything was provided and the condo was so clean. It was a very enjoyable stay!!!" "Hello Barbara, Thank you for your review. We are glad to see that you had a great stay at Waters Edge 408! We hope this means you'll be back again very soon for another wonderful stay!" "Hello Lisa, Thank you for your review. We are glad to see that you enjoyed your stay at Waters Edge 408! We hope to see you again soon on the Oregon coast." "I stay in Lincoln City every year for at least a week to three weeks. I've stayed at Waters Edge many many times but this was my first at 408 I believe. The unit met our expectations as they usually do hence the reason for returning. This unit 408 has really cool decor. Very fitting for the beach. Our stay was great and will rent this unit again for sure providing it's available. Thanks for a great vacation"
"Hello Andrew, Thank you for your review. We are glad to hear that you enjoyed your stay at Waters Edge 408. We are glad that the unit was comfortable and nicely decorated. We look forward to hosting you again soon!" 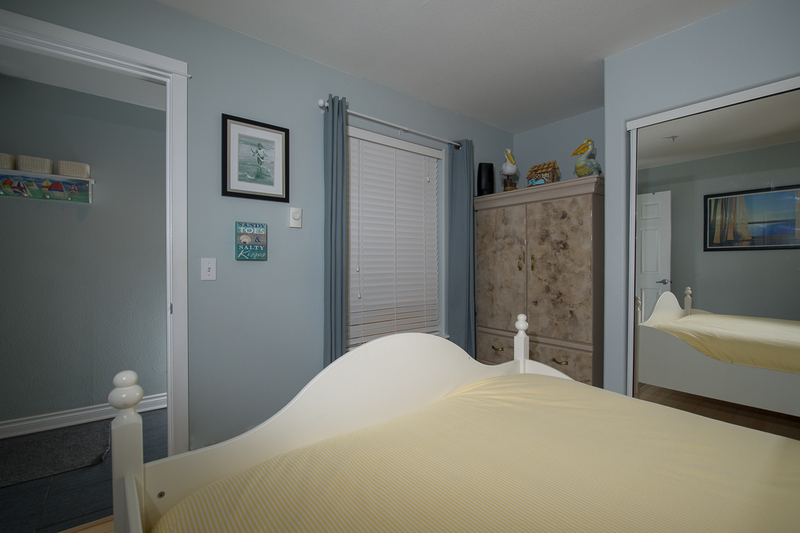 "Very cozy vacation rental, has everything you need and well decorated. Enjoyed our wonderful get away and hope to do it again real soon." "Hello Layne, Thank you for your review. We are glad to hear that you enjoyed your stay at Waters Edge 408. We look forward to having you stay with us again soon!" "It was perfect! Very clean. Absolutely adorable. Amazing view! Couldnt have asked for a better place to stay. " "Hello Jonna, Thank you for your review. We are glad to hear that you had a great stay at Waters Edge 408! We are glad to know that the unit was comfortable and clean! We hope this means you'll be back soon!" 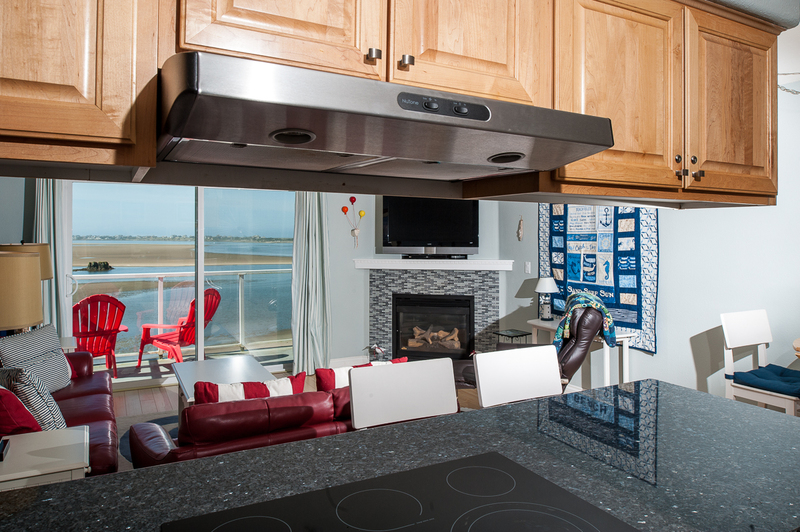 "We stayed at Waters Edge in two different condos because 408 was unavailable for the first part of our vacation. What a difference between the two! 408 was much better with a well-equipped kitchen (and not the owner's "seconds",) nice furniture and even a washer and dryer. An overhead light was broken, the flooring was not completely finished and an advertised pair of binoculars were not to be found. However, the pros outweigh any cons. Beautiful view of the bay, too. We would love to stay in this condo again!" "Hello LaVeta, Thank you for your review. We are glad to see that you had a wonderful visit at Waters Edge 408. 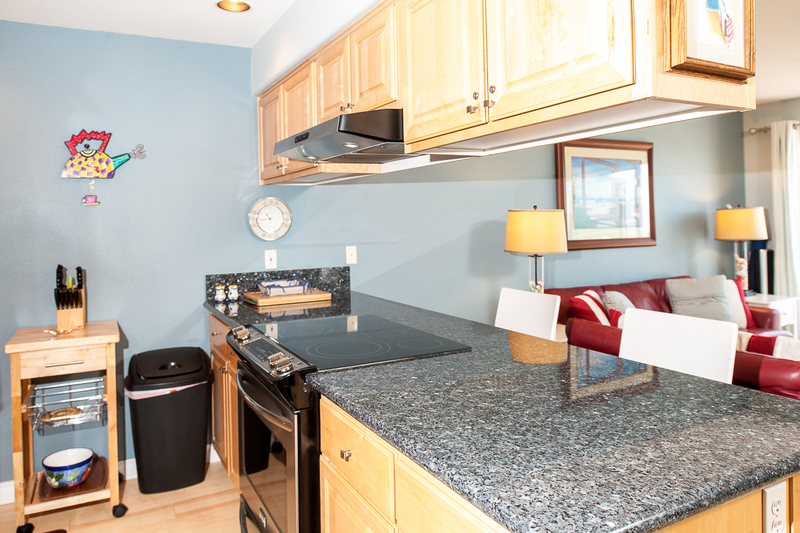 This unit is adorable and well decorated by the owners who want to guarantee that everyone has a wonderful stay on the Siletz Bay. We are sorry that you could not find any binoculars. These may have been removed by the owner or taken by a guest. We hope to have you stay with us again in the future!" "We were privileged to share our weekend with another couple. On the way home there were comments on how wonderful the two nights were. Thank you!" "Hello Kay, Thank you for your review. We are glad to see that you enjoyed your stay at Waters Edge 408! We are glad that you and your friends were able to have a wonderful time together, and we hope to have you all back again soon on the Oregon coast! Thank you again for your review." "I RENTED TWO UNITS AT WATERS EDGE FOR THREE NIGHTS FOR OUR FAMILY. WE ENJOY THE VIEW AND CONSTANT CHANGE OF THE WILDLIFE IN THE BAY. I NEED THE ELEVATOR." "Hello Pamella, Thank you for your review. We are happy to hear that you enjoyed your stay at Waters Edge 408. We are glad that these units are perfect for you and your family. We hope to continue seeing you down on the Oregon coast." "It was absolutely beautiful, definately will stay there again." "Hello Traci - thank you for taking time to send in your review. We are pleased to hear you enjoyed the Waters Edge unit you had booked. The complex is so very close to so many awesome features, the bayfront, the beach and all the Taft area has to offer. Again, thank you Traci and for your next coastal getaway Oregon Beach Vacations hopes to hear from you to assist in finding a property to visit." "Wonderful experience. Great location and exceptional view. Well stocked and comfortable." "Hello Lisa, Thank you for your review. We are glad that you enjoyed your stay at Waters Edge 408 and that you found the unit clean and comfortable! We hope to have you stay with us again soon!" "Destination wedding, and the condo was excellent! Easy to access things in walking distance and out of the main traffic of Lincoln City. Will stay again!" "Hello Martha, Thank you for your review. We are glad to see that you had a wonderful stay at Waters Edge 408. We look forward to hosting you again soon!" "Reserving the condo was fairly easy. Be sure you receive the important lockbox entry information at least a business day in advance. I almost didn't get mine in time. It all worked out though. As for the accommodations, this unit is cute, cute, cute. It's also very comfortable and well stocked with kitchen equipment. The beach area and view was entertaining as we watched avid clammers when the tide was out. It's a great place for kiddos because the water is calm and not too deep. A is a little bit of an ocean view but don't expect to watch the waves. Added bonus is this unit is right by the elevator!! I will be returning. " "Hello Donna, Thank you for your review. We are glad to see that you enjoyed your stay at Waters Edge 408! 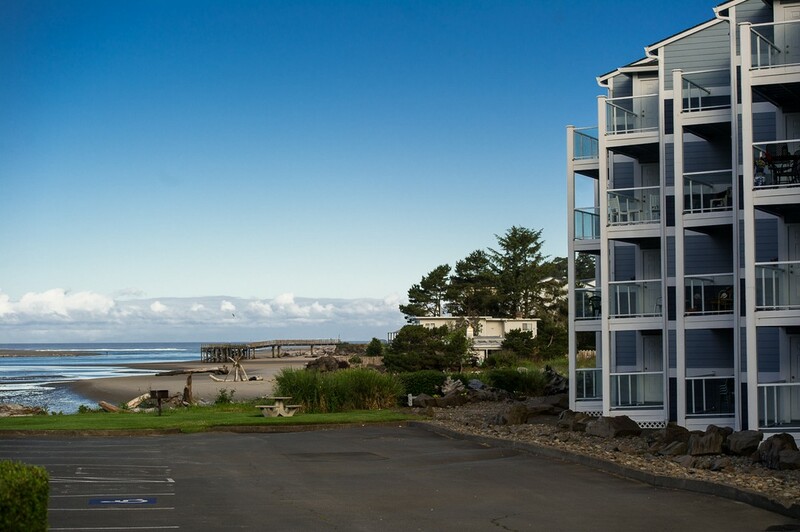 We can't wait to have you back again soon on the Oregon coast for another wonderful getaway! Thank you again for your review." "Loved the rental, had all the anemities needed and even some extra like the umbrella for the patio and some games. Could not get the t.v. in the bedroom to work." "Hello Shelley, Thank you for your review. We are glad to hear that you enjoyed your stay at Waters Edge 408! We hope to see you back again soon." "We had a wonderful time and fully enjoyed the condo, balcony and beach!" "Hello Jacqueline, Thank you for your review. We are glad to see that you had a great stay at Waters Edge 408! We hope this means you'll be back again soon for another wonderful Oregon coast vacation!" "Had a great time. Nice place, well appointed and very clean. We have rented many VRBO rental properties and this one was very nice. Thank you, Jeff "
"Hello Jeff, Thank you for your review. We are glad to hear that you and your daughter had a great stay at Waters Edge 408! We hope to see you back again soon!" "I wanted a weekend alone with my Mom and couldn't think of a better weekend than Mother's Day!The condo and view were fabulous. We were grateful the rental was pet friendly, but the terms of registering them seemed out of the ordinary. Our code to get in to the condo did not arrive a few days before as indicated, but we did receive it one day prior. All in all, I would highly recommend this beautiful condo. A couple of K cups would be a welcoming touch for use in the Keurig!" "Hello Elizabeth, Thank you for your review. We are glad to hear that you and your mother enjoyed your stay at Waters Edge 408. That unit is especially beautiful and cozy! We hope to see you and your mother back again soon on the Oregon coast. Thank you again for your review." "The condo is in a great location with easy access to the beach. When we arrived the unit wasnt very clean. There was dog hair on everything and the comforters on the beds were dirty. Also we couldnt get the tv in the bedroom to work. But other than that it was great! We had a great time!" "Hello Cassandra, Thank you for your review. We are glad to know that you enjoyed your overall stay at Waters Edge 408. We are sorry, however, to hear that the unit was not very clean on your arrival. We would have happily sent housekeeping over with fresh comforters and cleaned the unit more for you. We would have also sent maintenance out to try and fix the TV for you. Thank you again for your review, and we hope to have you stay with us again soon on the Oregon coast." "Good overall. No TV the entire week, didn't work and took 3 days for a response to fix." "Hello Steve, Thank you for your review. We are glad to see that you enjoyed your overall stay at Waters Edge 408. We see that you say it took 3 days for a response to fix it. We don't have any notes in your reservation about a TV, but we see that you booked through Airbnb, which is not our direct website but rather a listing site we use for the properties we manage. We don't know if you contacted Airbnb with your concerns and then they finally relayed the concern onto us or if you contacted us directly. Either way, we are sorry that it took so long to get back to you. Our main office is just a block away from Waters Edge Condominiums, so if you ever stay with us again, and cannot get a hold of anyone in a decent timeframe, please don't hesitate to come down to our office and speak with someone in person. We hope to have you back again soon." "Our stay at Waters Edge condo was very good. The condo was exactly as pictured and very comfortable. The TV in the bedroom does not work. Excellent view and right on the beach. " "Hello Stephen, Thank you for your review. We are glad to see that you enjoyed your overall stay at Waters Edge 408. We are sorry to hear that the TV was not working during your stay. We hope you were able to contact us about this issue. Thank you again for your review, and we hope to have you stay with us again soon on the Oregon coast." "It was wonderful! Love the location and the size of the unit. It is a must to stay on the 4th floor if you want a quiet stay. If on the lower floors you will hear noise/walking above you.A couple of ice cube trays. Which I purchased 2 and hopefully will be there my next stay.This is something that I don't understand...only 2 rolls of toilet paper for 5 nights. You get the same amount for 2 nights....why not increase that for each additional night! I think that is a property management thing which needs to be addressed." "Hello Shelley, Thank you for your review. We are glad to know that you enjoyed your stay at Waters Edge 408. We are sorry to hear that the unit was missing ice cube trays during your stay. As for the toilet paper, we provide two rolls per bathroom for all of our stays, regardless of length of stay. We recommend that our guests bring extras from home or purchase more as needed while on their stay. We outline what we provide for our homes on the check out page. We hope to have you back again soon." "This is a very nice condo on the 4th floor, the elevator was definitely needed! The condo was nicely decorated and roomy and had everything we needed. We really enjoyed the balcony and fireplace! The beach is a short walk and is beautiful, the bay is nice and not as breezy. My only complaint is that you do get road noise from Hwy 101 in the front queen bedroom that has a window facing the parking lot, not that bad but, I’m a very light sleeper." "Hello Lacey, Thank you for your review. We are glad to see that you enjoyed your stay at Waters Edge 408. 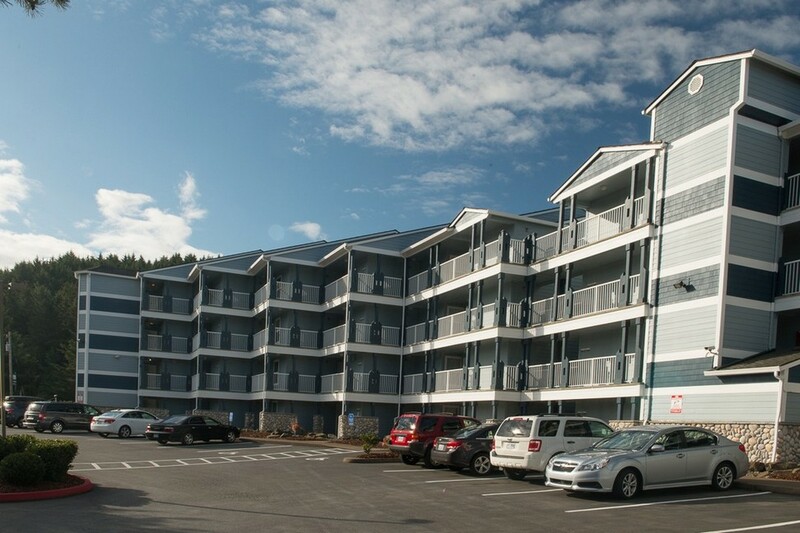 This is a lovely unit with a great view of the Siletz Bay. This unit does get some roadway noise but we think it's worth it for such a lovely view! We do have other units that are further down, away from the road. We hope to have you stay with us again in the future." "Positives (mostly) First: Our stay was fabulous and wonderful! Our party enjoyed the view immensely. The condo was well stocked with everything we needed as far as kitchen utensils go. As a wine drinker, I valued the array of wine glasses. The space is well decorated, it felt like a home-away from home. There was plenty of dish soap, laundry pods, toilet paper and paper towels. We stayed a total of 4 nights. 2 of us stayed for the first 2 nights; my boyfriend and I enjoyed sitting on the balcony and star gazing. The next 2 nights, there was 5 of us; we were still comfortable. We enjoyed walking out into the bay with our dog after the tide went out. Many kids were playing in the water, so it looked family friendly. My dog really loved her time here! There were poop bags, easy access spots for your dog to go. There is an elevator in case you need that! The beds were moderately comfortable, but not memory foam. The bedrooms did seem clean. There was a fan available. Negatives: There was no coffee available for brewing, but there were filters. There is an expensive IGA within a few minutes walking distance, so we bought some. There was however, an empty bag of coffee sitting next to the filters, that should have been thrown away during cleaning service... Which brings me to our BIG issue with our stay. We had BIG issues with the lack of cleaning to this place. There was no vacuum; I found human hair, dog hair, popcorn, dust, and just YUCK on the floor. It was obvious no one bothered to vacuum this unit in quite some time. The rug was also filthy. We swept out the rug three times, then we swept the living room area four times so that we could be more comfortable. I didn't realize I would have to clean up after others on MY VACATION. There was no spray cleaner available, it was needed. The doors and doorknobs had not been wiped down in sometime, and the shower had a ring around the drain. Other than the cleaning issues, we truly enjoyed our stay." 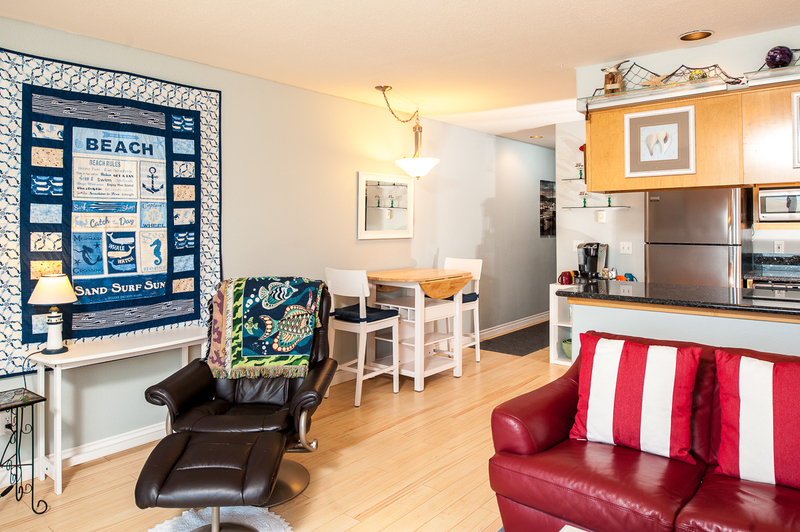 "This condo was lovely and well equipped. We love staying in Lincoln City and always stay on Taft Street being that it is on the bay. 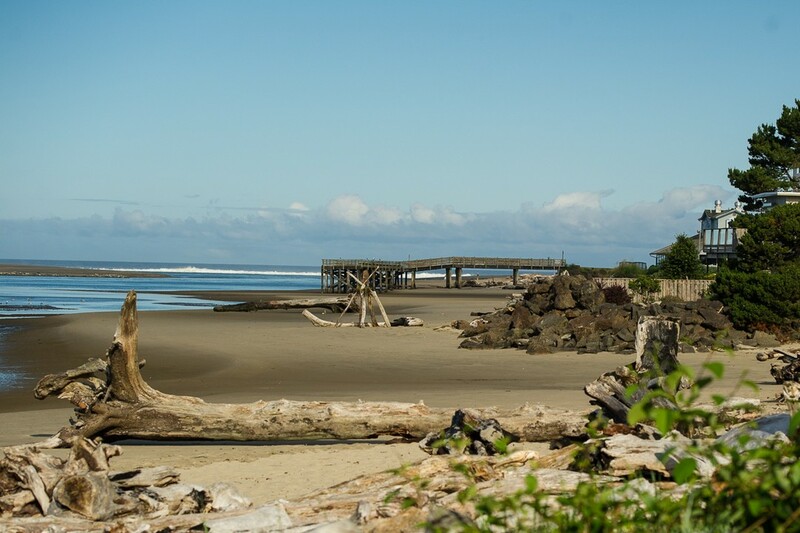 Easy access to the beach and restaurants.We have used Oregon Beach Vacations for over 5 years when we book our vacations. We've never left anything in a condo before, but this past stay in August we left two very nice rain coats in the master closet. We wrote to Oregon Beach Vacations as soon as we got back, and they replied that the jackets were never found or turned in. As I know that I left them in the closet, I was disappointed that the staff was dishonest and did not turn those items. Either they didn't see them when they cleaned the condo and the next tenants took them, I don't know, but they were never turned in. Make sure to double check for left items before you leave, it's likely you'll never get them back." "So everything was great with Oregon Beach Vacations and the condo, except the manager at Waters Edge condos! Long story but it was over our dog which we paid to have him there but he gave us a lot of grief over the dog. The room, view and the beach was excellent! " "Hello Kelly, Thank you for your review. We are glad to see that you enjoyed your overall stay at Waters Edge 408. We are sorry to hear that you had issues with the Waters Edge manager. This is something we are trying to get resolved currently. Thank you for your review, and we hope to see you back again soon on the Oregon coast!"